We interrupt our regularly scheduled Project Dessert to bring you the next in our "Meet Our Contributors" series—Food52's version of show and tell. We're asking some of the voices behind your favorite columns to share a recipe that represents them (and explain why). 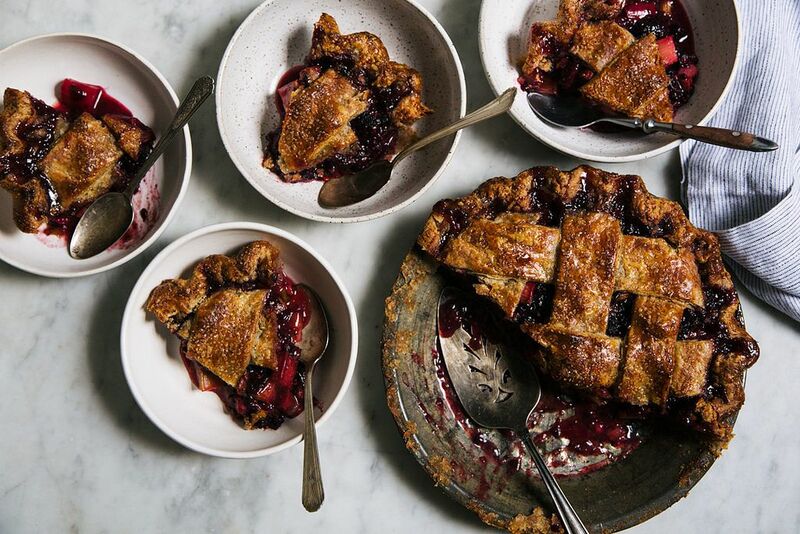 Between writing my book and blog and my general love for fruit in buttery crust, I have made so many fruit pies over the last couple of years that they have become my favorite thing to bake (just see my Instagram). 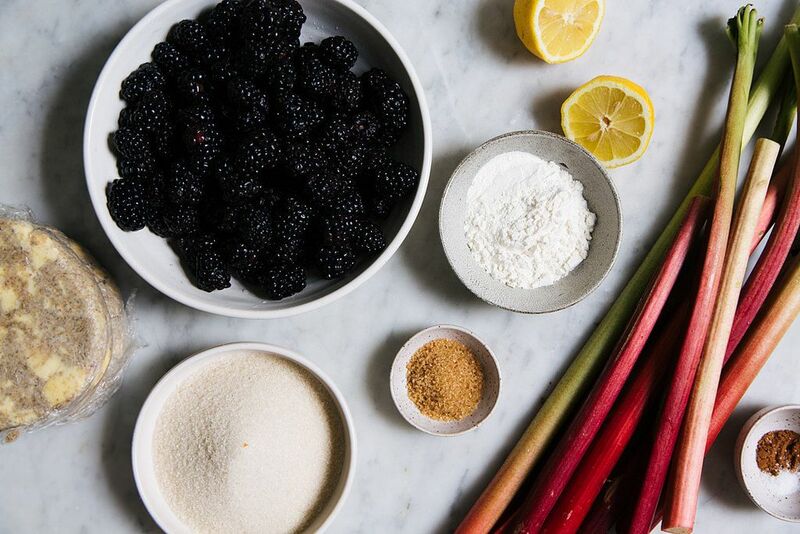 The first time I made a blackberry rhubarb dessert was during my annual summertime visit to see my family in Seattle a few years ago. It was the August after my brother’s twin daughters were born, and his family had just moved into a new house. It was wild blackberry season in the Pacific Northwest, and my dad and I had picked blackberries from his favorite secret spot earlier that day so we had a pile of freshly picked blackberries sitting on the counter just waiting to be used. My parents’ rhubarb plant had a few last stalks that were looking wilty from the heat, so I picked those too, then combined them with the blackberries and made a crisp covered with buttery streusel. We took the crisp to my brother’s new house, then after the babies were in bed, we ate bowls of it warm, topped with Earl Grey Ice Cream from Molly Moon’s. 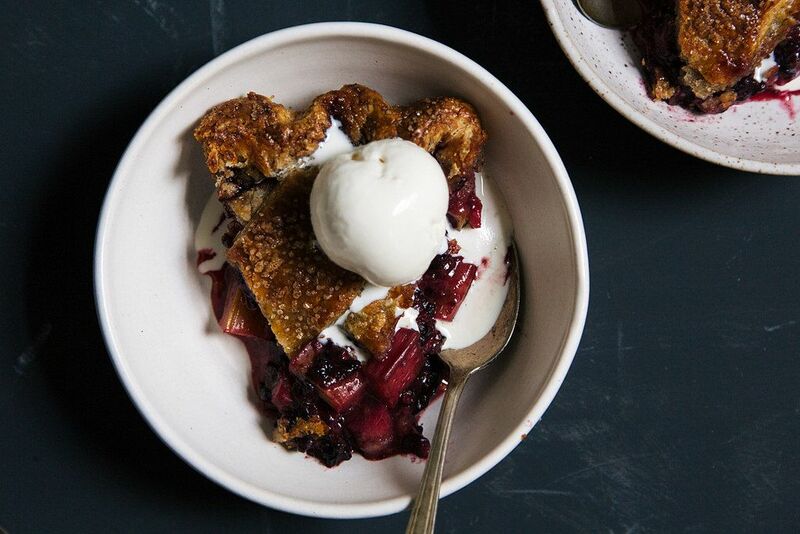 The combination was perfectly buttery, sweet, and tart, with little crunchy bursts of seeds from the blackberries and soft silky pieces of rhubarb. To me, this recipe feels like my favorite place (Seattle in the summertime), family, and the place where I am most at ease: in the kitchen. 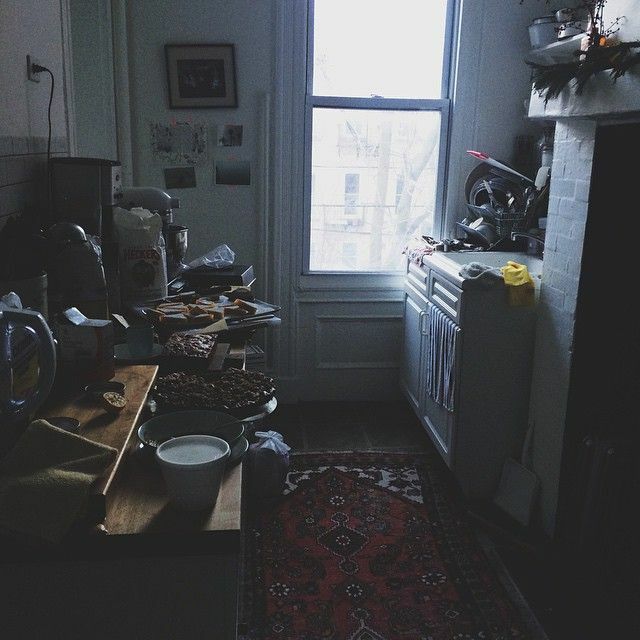 Yossy's kitchen, where pie magic happens. Bread and cheese. Maybe some super-chilled white wine too. I mean, I am probably going to get thirsty on this island, right? Oh, I don’t know, I am the worst at questions like these. Something that is maybe a little prickly and unassuming at first, and requires a little coaxing and care to appreciate, but once you do, you get to the good stuff. Maybe an artichoke? Yes, I’ll go with an artichoke. Sorry East Coast, but I think lobster is pretty overrated. Seriously, give me some Dungeness crab and a vat of melted butter over lobster any day. I’m lucky to have never really royally failed in the kitchen. I am not immune from making a crappy dinner or over-cooking eggs, but I don’t have any “Oh sh*t, I just dropped the birthday cake” kind of moments that I can recall. 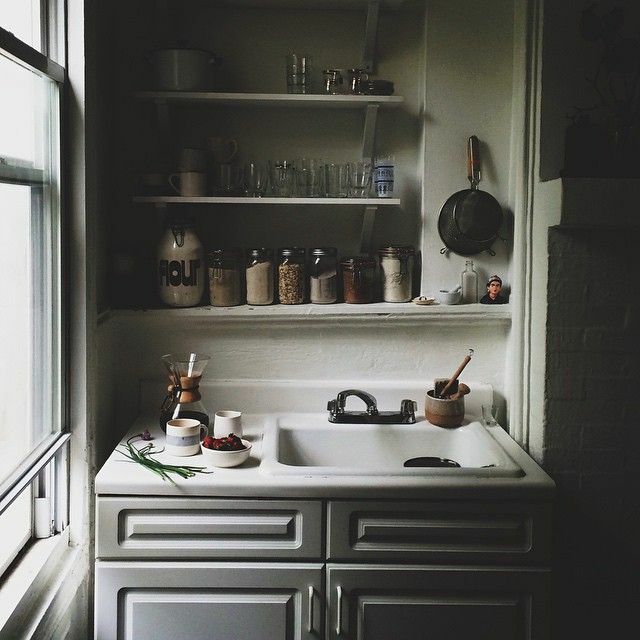 One time, I did have an ambitious dinner party in my former studio apartment that ended with a bathtub full of dishes and spaghetti, which was less than pleasant to wake up to the next day. 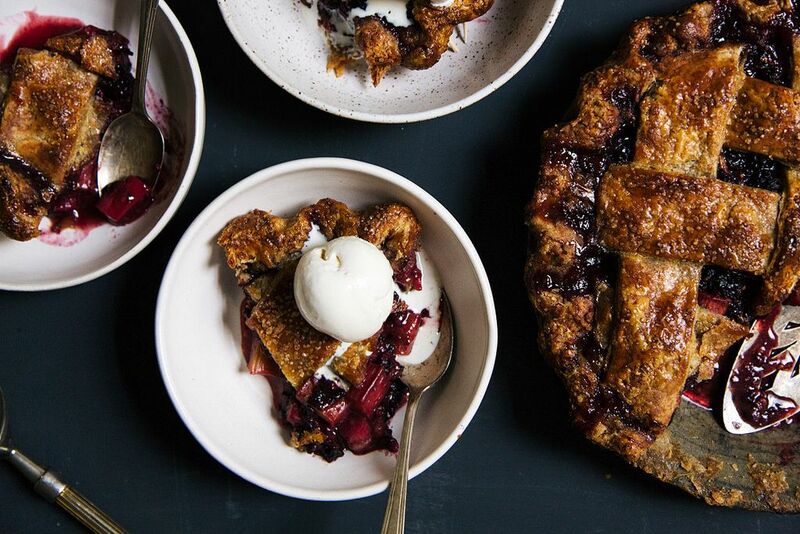 More: Watch Yossy make her Blackberry Rhubarb Pie. To make the crust, combine the flours and salt in a bowl. Use your fingers or a pastry cutter to cut in half of the butter until it is the size of peas, then cut in the other half until it is the size lima beans. Some of the butter will be completely worked into the flour, but you should have lots of visible pieces of butter in the dough, too. Combine the water and apple cider vinegar in a measuring cup. Make a well in the flour/butter mixture and slowly stream about 6 tablespoons of the water-vinegar into the dough while mixing gently. If the dough seems very dry, add more water a couple of teaspoons at a time. You have added enough water when you can pick up a handful of the dough and squeeze it together easily without it falling apart. Press the dough together, then split it in half, form into disks, and wrap each disk in plastic wrap. Chill the dough for at least one hour before using, or preferably overnight. When you're ready to make the filling and assemble the pie, preheat the oven to 400º F. In a large bowl, combine the sugar, lemon zest, and vanilla bean seeds. Use your fingers to rub the zest and seeds into the sugar, until well combined and fragrant. Stir in the flour, cinnamon, and salt. Trim the edges so they are even, then crimp them together. 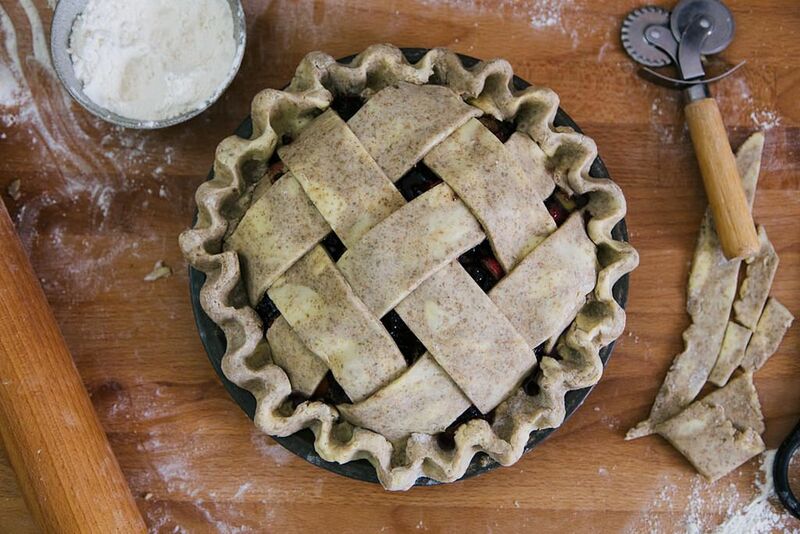 Alternately, cut the second crust into 1 1/2- to 2-inch strips and weave a lattice top. Slide the whole pie into the fridge or freezer for about 15 minutes, or until the crust is very firm. When you are ready to bake, carefully and gently brush the top of the pie with a beaten egg and sprinkle with a healthy dose of coarse sugar. Put the pie on a baking sheet to catch any drips and bake for 45 to 55 minutes, or until the crust is a deep golden brown and the juices bubble. Cool it before slicing and serving. Photos by Yossy Arefi and video by Pete Lockhart. Ahhh, these photos are SO beautiful. Beautiful pie! I enjoyed watching the video with my cup of coffee in hand right from my office cubicle at work. Is it crazy of me to say that it was relaxing? The only downside is that now I wish I had a slice of that pie. Thanks for sharing. I'm so glad to hear that you liked the video! I love that you found it relaxing. Seattle in summer, yes!! 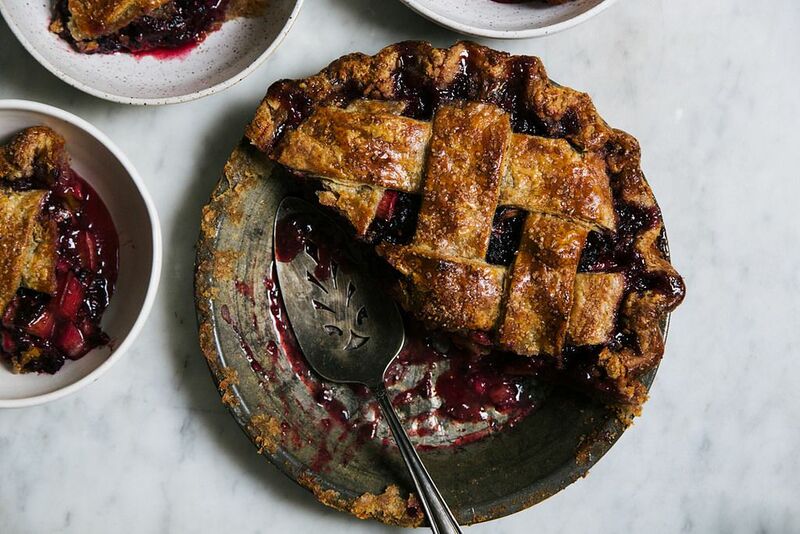 I recently overheard a rhubarb seller at the farmers market saying his favorite pie is blueberry rhubarb, so this blackberry rhubarb combination is intriguing! I'd love to try the rye crust too, but how to make the streusel option instead? Hi Angela, search my blog: apt2bbakingco.com for "Blackberry Rhubarb Crisp" and use the streusel topping from that recipe or any other crisp topping you like. Yossy, you are the QUEEN of pies! It looks almost too beautiful to eat...almost. And you make it look so easy! I'm in awe!